Whenever I make a pie crust, I think of Grandma Mary, my mother’s mother. Pies have always been a big thing in our family and I remember when Grandma taught me how to make my first one. I was 16 and my parents had gone on vacation, a very rare occurrence, I can assure you, and she was staying with me and my brother. I asked her to teach me and we set up on the table in the breakfast nook, put all the ingredients together, gently brought the pie dough together and rolled it out. This is the only cooking experience I ever had with her, which is a real shame considering the repertoire of recipes she had in her head! I didn’t realize until it was too late the importance of learning about food and recipes from family members, including my Mother-in-Law Ruth who passed away very early on in our marriage. Her sisters and daughter didn’t know her secrets either. Cherish your memories of cooking with family and remember to write down traditional recipes and family favorites, even if you need to measure ingredients as you go along because they don’t! For a basic, savory pie dough use a 3:2:1 ratio of flour to butter to water, plus a little salt (1/2 teaspoon per 1 ½ cups flour). 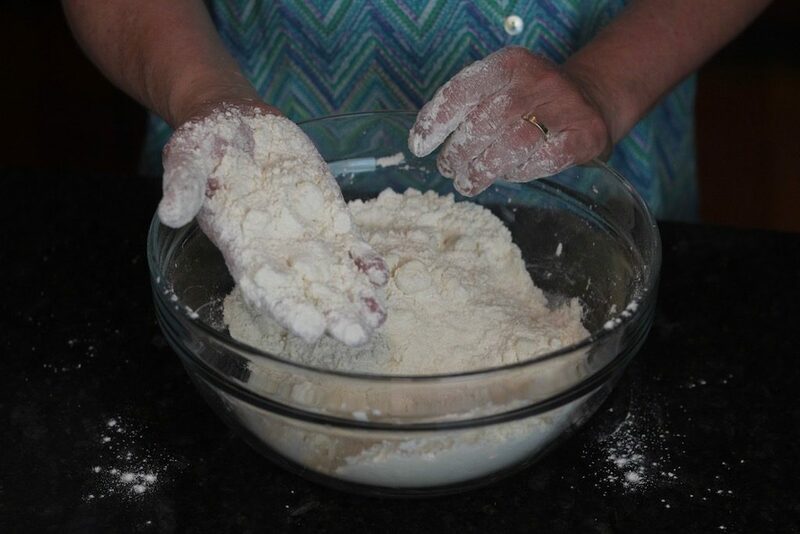 For a sweet pie dough add 1 tablespoon sugar per 1 ½ cups flour. Add more sugar for a sweeter crust, add herbs or shredded cheese for a savory crust. You don’t need special equipment to make the dough. Mix the dry ingredients in a medium bowl, add the butter, which has been cut into small pieces and work the four and butter together by smearing together with your thumb and index finger until the butter is the size of peas. Alternatively, use a pastry blender, electric mixer or food processor, but be very cautious of over developing the dough when you add water with these appliances. Smearing the butter coats the flour with fat and is one step in preventing an over-developed gluten. The most important factor is to use as little agitation as possible: minimal mixing, no kneading. Want a flakier crust? Leave the butter pieces in slightly larger pieces. Butter contains about 15-20% water and milk solids, the rest is fat. Because of the water content, a butter crust is crispier than a crust made with lard or shortening, both of which are 100% fat. The water in the butter turns to steam, puffs up the layers and creates that much desired flaky, crispy crust. Water is always given in an approximation; it depends on how much moisture is in the flour. Use only cold water to keep the butter from getting too soft. Add about half the water at first and gently toss the flour and water together. Pick up a small handful of the dough and press together. If it falls apart, add more water, toss and check. Keep this up until the dough holds together with no crumbling. For a single-crust recipe, scoop the loose mixture onto a piece of plastic wrap, large enough to contain the disc. 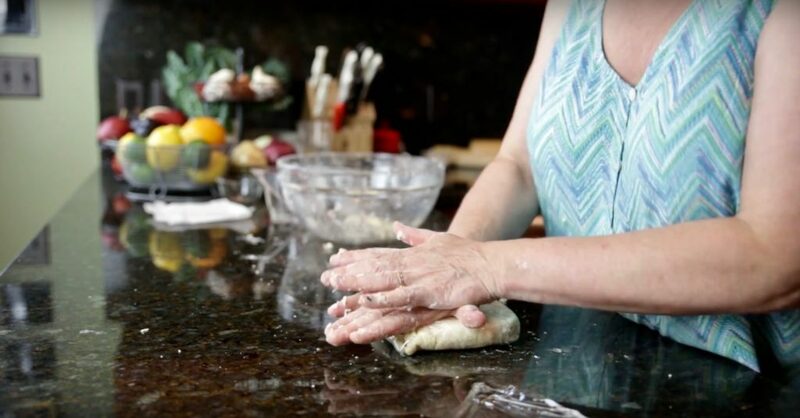 For a double-crust recipe, divide the loose mixture in dough in half and place each portion onto a piece of plastic wrap large enough to contain the disc. Gently form a mound and wrap the dough. Push the mound down with the palm of your hand and form a disc. Refrigerate at least two hours or overnight to hydrate the flour. This recipe gives the ingredients for a double-crust pie. Divide the recipe in half for a single, or make the whole recipe and freeze the second disc. Mix the dry ingredients in a medium bowl, add the butter, which has been cut into small pieces and work the flour and butter together by smearing together with your thumb and index finger until the butter is the size of peas. 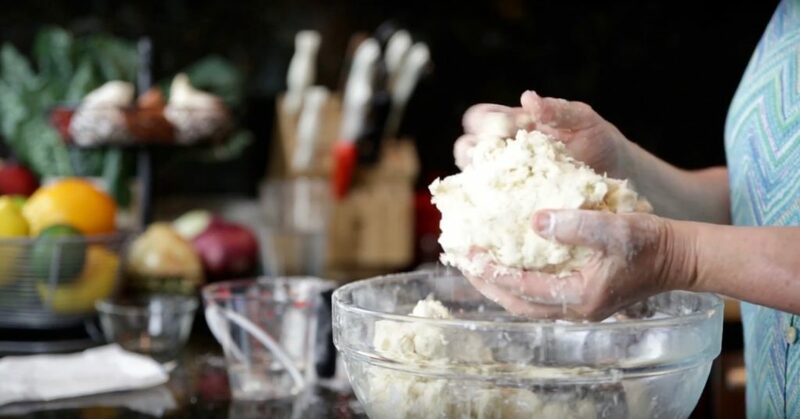 Alternatively, use a pastry blender, electric mixer or food processor, but be very cautious of over developing the dough when you add water with the appliances. Water is always given as an approximation; it depends on how much moisture is in the flour. Use only cold water to keep the butter from getting too soft. Add about half the water at first and just toss the flour and water together. Pick up a small handful of the dough and press together. If it falls apart, add more water, toss and check. Keep this up until the dough holds together with no crumbling. Divide the dough in half, it’s loose and crumbly because you haven’t forced it together yet, and scoop each half onto a large piece of plastic wrap. Gently form a mound and wrap the dough. Push the mound down with the palm of your hand and form a disc. Refrigerate at least two hours or overnight to hydrate the flour. Freezes well. Freeze as a disc or roll out and freeze as a rolled up sheet. See video here.